This is a complete inverter circuit project which features automatic mains switching, automatic charging when mains is present, and automatically starts inverter when mains is off. Get the full size inverter circuit diagram pdf from HERE. As this project is fairly long and time consuming, so we’ve divided it part by part, find out the steps below. For the oscillator part, you have three choice. You can use either a 4047 based square wave oscillator, or the SG3524 PWM oscillator or the 74LS112 based Oscillator. Square wave inverters are sufficient to run mobile chargers, CFLs or LED lights. However if you’re planning to run inductive loads like a Fan or AC motor, then choose the SG3524 based PWM oscillator or the simple modified sine wave inverter. Below the steps to make the complete inverter project. Also have a look at this simple yet powerful 250 watt inverter project. Thank you for your valuable guide. Sir, I want to build solar inverter for driving A.C. load of 200watt for 5 hours. Also I want to charge battery by solar as well as A.c. 230 volts But preference to solar . Since in Maharashtra now tariff rate is very high. Also load shading problems. October 22nd, 2011 at 3:50 pmSchematics is the first picture. Right click and save target as to get full resolution image. October 23rd, 2011 at 9:10 amThank u, is very clear now. 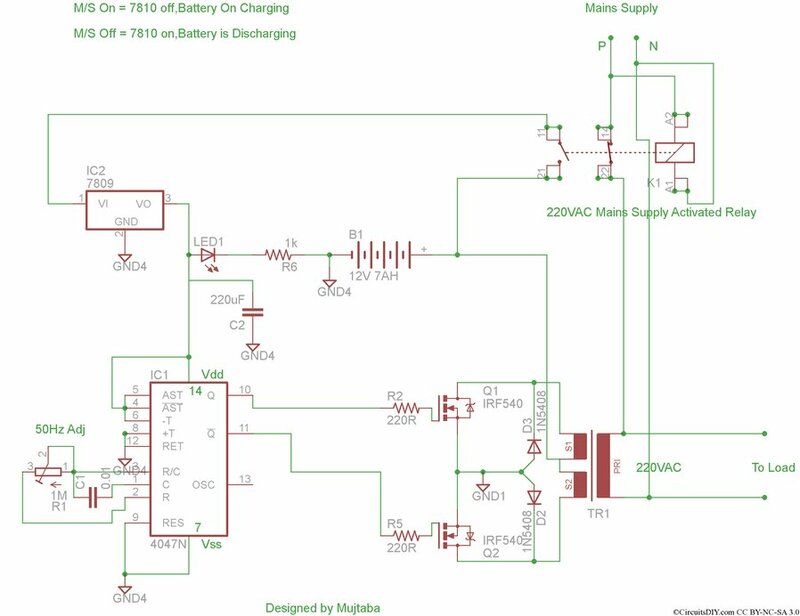 Can i use to charge 12v 70ah battery? October 27th, 2011 at 12:08 pmTo charge 70Ah battery, you need atleast 7Amps transformer for C/10 mode. For my inverter transformer-primary(723turns) and sec(36). And i have 12v 70ah for the inverter. What is my transformer amps rating. If is not suitable what should i do? October 27th, 2011 at 3:27 pmTransformer Amps can’t be determined by counting number of turns. Generally 6-7Amperes transformers weight around 5Kg. November 4th, 2011 at 5:15 pmfirstly u have to tell us your load power in watts? wothout max power it is not possible that i help u? November 11th, 2011 at 8:44 pmThe load 600w max. Concerning the relay, pls explain the pins, and how to connect the pin to regulator and the output of the inverter. I buy one 220vac, 12vdc. But the pins does not av number. Tell me the function of those diode and why we use 7809 regulator not 7805 or 7812. And can this inverter charge 12v 100ah battery. that is also in your mind that when you start design inverter circuit, for this purpose you have need re wounded tranformer,bcoz the tranformer which is available at shops can not provide require voltage when you supplied it by battery…..so you have use your own rewounded tranformer for good voltage regulation on Load…….. Thank you very much for very interesting circuit . i would to try the project. what will be the size of pcb printing? 00 X 00 in Inches ? or pixel ? would you be able to help me in this regards ? What will be the printing size of PCB ? It’s powered by a 12 V lead-acid battery. Please clarify your question. 1/4 watt resistors are enough, there’s no need of using high wattage resistors. how to increase the capacity (wattage) of inverter. To drive 1hp pump (subm) for only 10-15min. what will be the improved design of this circuit. Till now i search and found some info. 2. increase in transformer rating. 3. the battery ah capacity and 24v instead of 12v battery. what will be the final design after this modifications. Unfortunately the designer(Mr. Arup Basak) of this inverter project is now busy with other stuff. pls how d frequency adj can be set? what will be d outcome if d freq is ? how can measure it? i need help .i hv build cct with ic sg3526. wit d freq feature. Sorry, but I’ve no idea about SG3526, you may look at the datasheet. actually I think its a simulated circuit.BTW i need the improved design of the circuit at least for home lightning with increased wattage of 500w at 90% effecincy. I need it urgently cos its my project. if you have some free time please suggest a inverter circuit. actually I visited some another blog and no one out there to help me. Hi Shankar, nice to get another feedback from you. As you may already know, the original designer is doesn’t maintain this blog any more, and it’s live again after 3 years. I never worked on a inverter project before, so I don’t want to suggest anything. But I could suggest you one thing, to achieve 90% DC to AC conversion efficiency, you need a complex MCU controlled pure sine wave inverter. And you need to implement the best physical design, also the best transformer. The easiest way to make a high efficiency inverter is grab an old dead battery computer SMPS (Rs. 400-500), and connect it to the biggest Lead-Acid battery you have. All done ! But if it’s your college project, then I can’t help you much, anyway stay in touch, I’ll try my best. hi arnab.can you suggest me a good circuit simulator software which can be able to simulate pic micro controller. An alos contain latest component for simulation various electronics circuits. sorry for my bad eng..